I've made french macarons many many times. My first few attempts ended in misery - broken shells, cracks, hollows, no feet. Everything that could go wrong in a bad macaron - did. However, I never stopped trying. Who knows how much pounds of almond flour/meal and powdered sugar I sieved. But, it was not in vain. I learned so much from all these failures, and I want to share my tips and tricks with you. Today, I make perfect macarons every time. Not a single crack in any batch. Every batch has feet. They are perfect. When I first started, I did use recipes that you find everywhere online. The ones that sift powdered sugar and almond flour together. The ones that get folded into stiffed egg whites. They failed me. I switched to recipes that used meringue powder. I even did Pierre Herme's recipe, that require boiling sugar and water to a syrup stage. I did everything. The recipe that folds almond meal/icing sugar into stiffed egg whites never worked for me. I tried them a thousand times. What irony - they are now my favorite macaron recipe. The meringue powder recipe was the first success for me. However, those produced hollows for me. Hollows are the air pocket gap between the shell and chewy center. The recipe that requires the sugar syrup also worked. They also produced hollows and lopsided feet on the macarons. One side had more "feet" than the other. I had perfect ones in some batches. But I disliked making syrup. It was one step I wanted to remove. 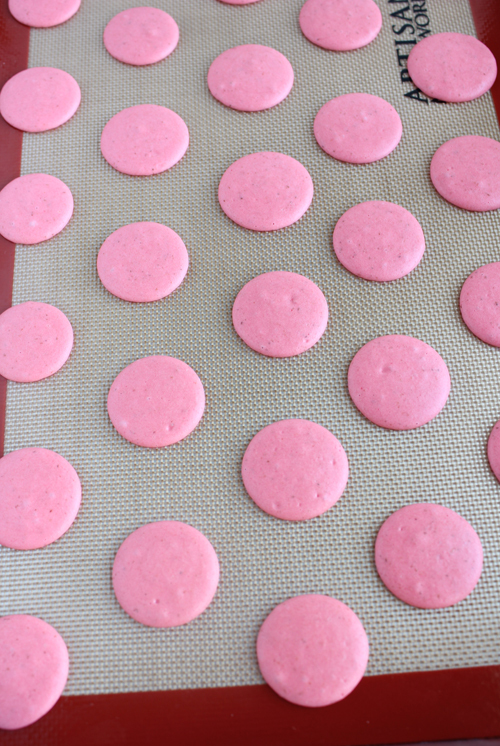 Making macarons is already tedious enough, I don't want to add another step that could go wrong. So I went back to the first recipe I've tried. I modified it just a little bit. From all the mistakes and tricks I've learned - My first recipe worked. I was thrilled. 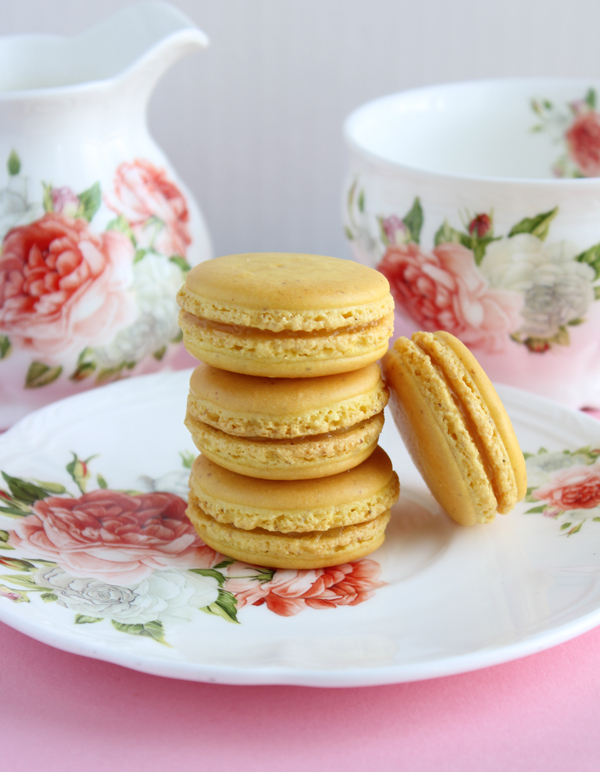 The recipe that is the most simplest, also produced the best macarons for me now. Ironic that I use to hate it so much. Ok, let me share the recipe first. Then I will share my tips and tricks. 1. Sift the salt, powdered sugar, and almond flour into a large container. Discard any clumps in the sieve. 2. Using a whisk attachment, beat egg whites with cream of tartar until foamy. Add sugar in 3 batches. Continue beating until stiff peaks form. Add gel food coloring, if desired, whisk again. 3. Add 1/3 of the almond mixture into the egg whites. Fold until incorporated - about 15-20 turns. Then add another 1/3. Fold again. Repeat one last time. It will take about 65 folds for the right consistency. 4. Pipe small circles onto a baking sheet/tray lined with a baking mat or parchment paper. I used 3 half-sheets/trays. 5. Let rest until a skin forms. It should no longer be sticky. 30-60 minutes. 6. Bake at 275F for 17 minutes. 7. Let cool completely before attempting to peel them off. This weekend, I made 3 full batches of that recipe. Chocolate, lemon, and raspberry flavor ones. Every macaron had feet. Not a single crack was found. Okay! Now for the tips and tricks. I guarantee you can get perfect macarons too. 1. Buy/Get a food scale. 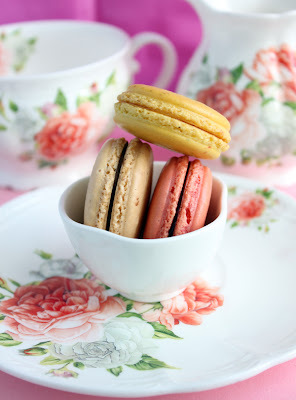 Macarons are so delicate. You want precise measurements. 2. Almond flour can be made at home or bought at a store. Regardless of how you obtained it, sieve only the almond flour/meal before starting the recipe. You should remove all the almond bits that are not powdered-like. You want to start your recipe with real almond flour, not just finely grounded almonds. Now, from the sieved/sifted almond flour, measure out the 120 grams to start the recipe. 3. Aged egg whites are important. Don't use fresh eggs. Crack and separate your eggs whites into a small bowl. Loosely cover it with a paper towel on your counter overnight. 4. Always sift your icing sugar and almond flour, even if no clumps are visible. This will prevent cracks. 5. Beat your egg whites until foamy before adding sugar. Foamy like a thick cloud in a bubble bath. Then add your sugar in 3 batches. This helps dissolve the sugar. 6. Beat your egg whites until stiff peaks form. Stiff but not dry. It should still be shiny and glossy. Add gel food coloring now if desired. Whisk to blend. 7. The consistency you are looking for after folding all the almond mixture is "magma." It should flow like magma from your spatula when you lift some batter up with your spatula. A ribbon should also form in the batter when the magma falls down. This takes me about 65 folds. 8. The batter should not be super thick, or too runny. Too thick, and you will have peaks in your piped circles. Too runny and you will never have perfect circles. A piped circle should lose any peaks within 45 seconds if your batter is correct. 9. After you pipe your circles, bang your baking sheet gently on the counter several times to pop any air bubbles. Do this to all your baking sheets. 10. Let the skin form. This can take 30 to 60 minutes. A skin should form around the macaron. The sides and top should not be sticky. Touch it before baking. 11. After the skin forms, preheat your oven to 275F. Bake for 10 minutes. Then spin/rotate the tray, and bake for another 7 minutes. This ensures even browning and prevents the oven from getting too hot. If it is too hot, the macarons will crack. Double pan your sheets if necessary. 12. 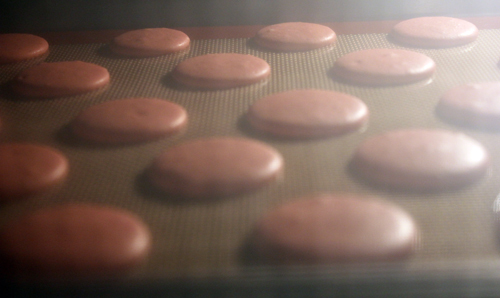 After the macarons are done baking. Let them cool completely. If they are still warm, it won't peel off the parchment paper. I hope my tips and tricks help you. They have definitely helped me obtain perfect macarons. Do you want to know what it looks like when it's baking? I do. I sit in front of my oven to watch the magic happen every time. It only takes about 8 minutes for magic to happen. 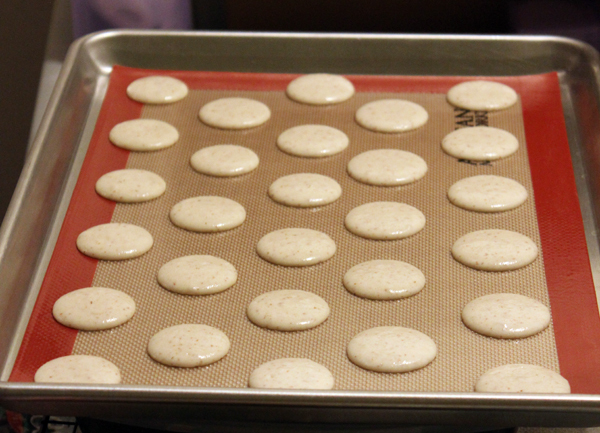 Watching the first batch form feet is always my favorite part in making macarons. I sent my friend some macarons via snail-mail, aka the USPS. I hope they arrive safely. I will find out on Wednesday if you can send/mail macarons. From my 3 batches of macarons, I made about 120 filled cookies. Due to being tired and lazy. I chose to fill them with fillings I can get from a jar. I chose nutella for chocolate, lemon curd for lemon, and raspberry preserves for raspberry. Next time I will make ganache and flavored buttercream. 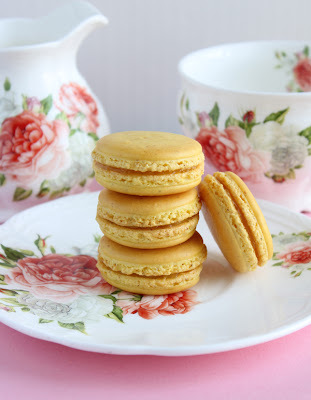 I hope my post helps you make perfect macarons too! So pretty. Great job they all look so even in size and shape. And Your Recipes Gallery will be displayed like this : Cooksjoy where we link the full recipe back to your site. hi i was just wondering if i have insufficient baking sheets is it possible to leave the mixture in the bag in t he fridge or something while i wait for the rest to bake? also is it possible to bake more than 1 tray of macarons at the same time? @Unknown Hi! I wouldn't recommend leaving the mixture in the piping bag. Macarons are very tricky. While it's resting in the piping bag, the egg whites may break down, causing your batter to be runny and other problems. If you are short on baking sheets, I recommend you pipe them on parchment paper on the counter. Then you can slide the parchment paper onto a baking sheet when you have one available. If your baking sheets are small, and you can fit 2 trays on the same rack, then yes, you can bake more than one tray. However, do not bake one tray on the top rack and bottom rack. 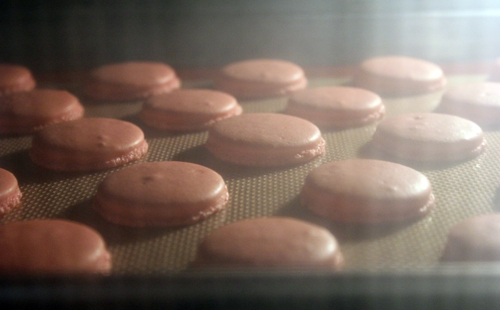 Macarons like the oven to themselves. The bottom rack macarons will likely burn and crack. 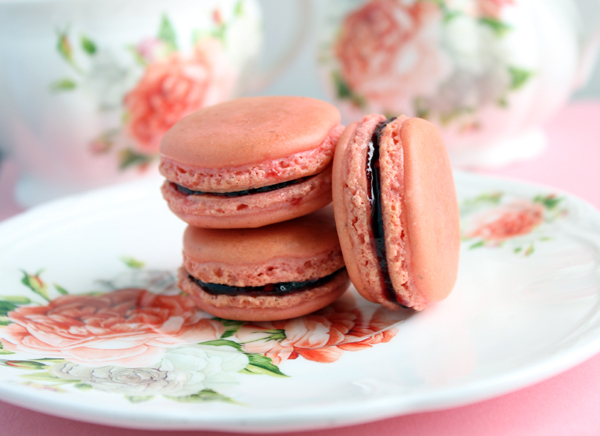 I just tried this recipe after making multiple batches of macarons almost everyday for a week. I have had a few minor successes and many failures but this recipe worked better than anything I tried! The macarons are perfectly smooth and have nice, even feet. I am so incredibly happy with how they turned out -- thank you!!! @Kate You are very welcome! I'm glad they turned out successful for you too!!! @yatt I do not use a template. It is all free-hand piping. Thank you for the recipe! I can't wait to try it Tommorrow. I'm planning to add Nescafé powder to make it a coffee flavor hopefully it will work. 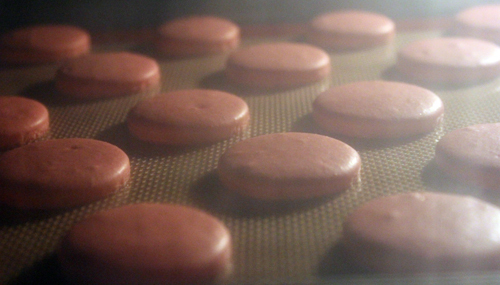 What does salt plays in the role of making macarons? 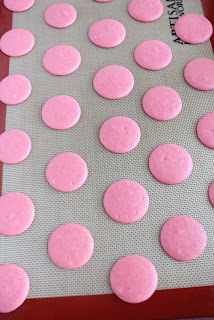 Hi Gwen - I'v had a couple of disastrous attempts at making macarons and would like to try your recipe. Your recipe calls for 'sugar' and 'powdered sugar'; is the first just ordinary white sugar or caster sugar and what is powdered sugar - icing sugar or something different? The first sugar is just regular white sugar. The powdered sugar is icing sugar. Hope this helps. Thank you for this! I had one success and many more failures, then tried this last night. All my macarons had feet, no cracking! Amazing. My oven is all over the place with temperature the higher I go, so I think the lower temp really helps. I am so excited! When you make the flavored shells, or add coloring, how much do you add? Do you modify the rest of the recipe at all? So excited to put my days of craparons behind me! Gwen! I just came across your blog trying to figure out why my first ever batch of macarons baking in the oven didn't have feet! They were indeed irregular and peaked when I piped them out and since you suggested this is due to undermixing I scraped the remaining two trays of piped macarons back into the bowl for extra folding. Now I have beautiful round smooth macarons baking and FEET growing! You just made my first ever batch of macarons a success! Thanks ever so much! Can you cut down on the granulated sugar so the cookie itself isn't soo sweet? When I make them, they turn out very bubbly, and have a bunch of tiny holes all throughout the surface without feet. Also, when I try beating the egg whites, it doesn't work for me. I have to put in the sugar when it's a soft peak. And should the rack in the oven be in the middle, I usually put it at the top, with a tray at the bottom to block the heat, then switch. Please help~ I'm desperate! @Sabrina Hi Sabrina. Try tapping your piped sheet pan on the counter a couple times to bring air bubbles to the top and to pop them. This should also help with the no feet problem. Egg whites need to be beat in a bowl with no oil/fat. Make sure all your bowls and beaters are clean from oil. Putting the sugar in at soft peaks should be ok too. Just beat until stiff in the end. I have my rack in the middle, and double pan my pan if needed. I only rotate the pan halfway into baking, I don't switch it to any other rack. @Wendy Korz Thanks! Your advice was awesome! 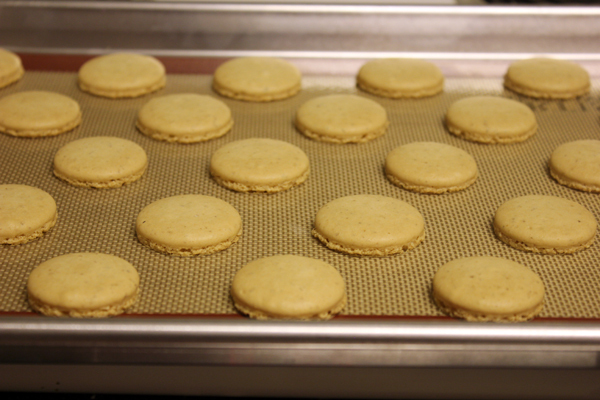 However, when macarins came out, they were super flat, and the feet were barely there! Did I over mix? Hi Sabrina. You probably did over mix. They shouldn't spread out to 'flat.' If you over mix, the batter will be runny and spread out like crazy. Mine hold their shape the whole time, even after banging it on the counter. Otherwise...the egg whites were not stiff peaks. Hope this helps. Are you having these problems using my recipe and technique? Hi. Never leave batter out. Pipe them onto parchment paper to dry. Slide the paper onto your baking tray after you are done with the first batch. And repeat. This will help with the 1 baking tray problem. Do you grind the almonds in the food processor? The first time I followed this same recipe that I found online they were near perfect! I had ground up my own almond flour. The second time I use almond meal/flour I bought at a store. However this time the batter remained coarse during the macaronage and did not thin out no matter how much stirring and folding I did. Eventually I just piped it just to see how they would turn out and they were all cracked and a mess. I sifted the almond flour both times so I can't imagine what I did wrong! Tried the premade almond flour again with the Italian method and again got a thick coarse batter that would not thin. I can only think its the almond flour causing the problem. What do you think? A food processor is on its way so I will find out soon enough! @Ellie Anderson Hi. I do not grind the almonds in the food processor. I just buy the almond flour from the store, and sift them all into a container, and then measure out the right amount when I want to start making them. I discard all almond pieces that failed to be sift through. You may need a finer sieve if the batter is coarse even after sifting. I hope this helps. Could it have been the food coloring then? I use wilton gel food coloring. The first time I made macarons (the sucessful attempt) I only used a few drops and got a light pink. The second and third attempt I wanted a darker blue so I added much more gel food coloring. Could this have set the batter off and make it as thick and pastey as it was? @Ellie Anderson Hi Ellie. I just actually made a batch of macarons, and used a couple drops of wilton food coloring. The consistency is magma like, and a ribbon forms when i pick up the spatula. I use gel paste color. Do not use any water food color. The gel paste shouldn't affect the batter, especially if you add a few drops. Gel paste is crazy concentrated...I can't see how you can use so much that the batter is ruined. Regardless, less say you used too much gel paste, let the skin form when you air dry it. Too much gel paste will just have a longer skin forming time. It usually takes an hour for my skins to form. Also, if the batter is too thick, give it a couple more folds. It should be magma like and form/hold a ribbon. Don't over fold, or it will be runny.I hope this helps. So it wasn't the gel food coloring. Then it must have been the almond flour! I have a food processor coming soon so I will have to do a test between grinding my own almonds and using the pre-made almond flour again. Thanks for all your help!! My history with macarons is not something to be proud of. I had few successes but mostly failures. I couldn't count how many batches of failed macarons ended up in trash bin. Yesterday I tried your recipe along with all tips and they went out PERFECTLY. My 7 year old son takes them for his becoming a pupil celebration in school. Hi Gwen! Awesome recipe! Worked out perfectly on the first try! I am now keen on making chocolate macaroons and was wondering how much cocoa powder do I use and replace with? Is is okay if I use wax paper? Is is the same as using parchment paper? It's ok to leave your egg whites out overnight. I even left them out for 2 days. Nothing went bad with them. Do not use wax paper. The wax will melt off during baking. Use parchment paper. Wax paper is not intended for baking. Hope this helps. I want to ask about resting time for macron before baking.wht kind of temperature need to make crust on top.chilled or humid or hot or room temperature. Most of the time is rainy season so weather is quit humid.ols suggest. .its very urgent. .
After try every weekend for months, you're recipe and tips helped me make perfect macarons. Thank you! Thank you very much for the macaron recipe. I tried the recipe three times this week, and my macaron came out perfect every time. They are so beautiful and delicious. I didn't even weigh the ingredients, because I don't own a scale. 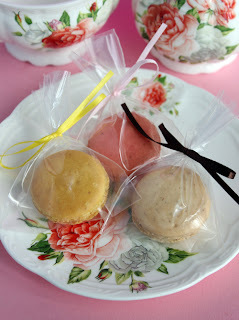 I'm so thankful for stumbling upon your blog, I'll definitely treasure your macaron recipe forever. @Gwen - how can I baked my macarons less sweet? Hi! 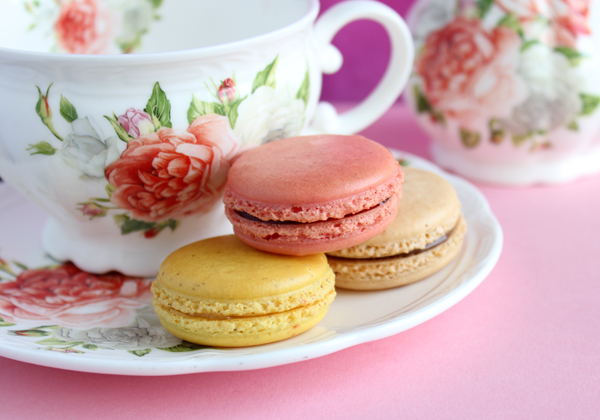 Macarons are just inherently sweet. You can fill them with fillings that are less sweet to balance out the sweetness. I also find that they taste better after 24 hours, and are a tad less sweet. Hope this helps. honestly i haven't tried your recipe yet but i'm going to since it's holiday now. however, i've tried making macaroons before and it was a mess. my first on has feet but the coloring turns brownish as if it was burnt, and the second batch has the right color yet it spreads. do you have any solution. also, what if i realize that i over mixed my batter and it's runny. how can i turn it into the right consistency? - what can I Do, if the batter is too runny? - when Do I have to add Icing sugar and when regular sugar? I'm sorry! I meant gwen, of course! If the macarons turns brownish, as if burnt, then you baked it too long or at too high of an oven temperature. Runny batter occurs when you over mix. I would test for consistency often. Try not to over mix. You may also have forgotten to age your egg whites, or perhaps you under beat them, or you let the beaten egg whites rest for too long before incorporating the almond/sugar mixture (beaten egg whites deflate quickly). I add the regular sugar when I'm beating the egg whites. The powered sugar is sifted with the almond flour, which will be folded into the beaten eggs when stiff peaks are achieved. Hi Gwen, i wanna know if the mixture of almond flour, powdered sugar and salt need to mix it using food processor or just simply fold it? Thank you. They don't need to go into a food proccessor. As long as you sifted the mixture beforehand to make sure there is no big almond lumps. Hi Gwen. About the gel coloring, i need to add into the egg white during it reached soft peak or stiff peak? Then i have to whisk or just simply fold it? I tried to add it during stiff peak but turn out i get a non shiny n smooth batter. End up i got lopsided feet. Help me. Thank you. @Pretty Sweet I would just mix/add 1 tablespoon of cocoa powder in with the dry ingredients and proceed like normal. I used your recipe to turn out my very first batch of macarons WITH FEET AND NO CRACKS. I was thrilled. Have been trying for some time with limited success. From now on yours is the only one for me. I have been making macarons for about 5 months. My uncolored ones come out perfect, however when I color them, the color looks faded and the colored macarons crack. I have baked them on the same cookie sheet with uncolored macarons and the uncolored ones do not crack. I am using Americolor gel color. I am dividing the batter so that I can have two colors without making two batches so I am adding the color after I have folded in the flour/powdered sugar mixture. Any suggestions? @Allison Hi Allison! I usually add the color gel after I beat the egg whites. However, when I want 2 or more colors in one batch, I fold the almond mixture into the egg whites. BUT before the mixture achieves that magma consistency, I divide the batter into 2 or 3 bowls. I add 2 to 3 drops of the gel paste in each bowl. Fold a little more, and when the consistency is reached, I stop and pipe. Colored macarons take longer to dry and to form that skin. So if you find you are having cracked shells, let them dry a little longer, until that skin forms and doesn't stick to your fingers when you touch it. After that, then bake as usual. Hope this helps. I am letting them dry the same amount of time as the the uncolored ones. They are not sticky at all when I put them in. I will try adding the gel earlier though. Thanks! Hi Gwen! I was wondering if your macarons sent well in the mail? Hi Amber. Yes the macarons did survive the 2 day mailing trip. They arrived and tasted just like a macaron should! Will that work if i keep my egg whites in refrigerator for an overnight? @Anonymous Yes, it will still work, but bring the egg whites to room temperature before continuing with the recipe. Hi Gwen! Can you please tell me how much extract to add to the macarons to flavor them? I am assuming that is what is used to produce the different flavors? Thanks! I am achieving excellent results with your recipe for which I am most grateful. I would however like to try chocolate macarons and would like to know how much cocoa powder to add to your recipe. @Anonymous Hi Rob. I would just mix/add 1 tablespoon of cocoa powder in with the dry ingredients and proceed like normal. Is the egg white part in this recipe replaced by meringue powder ok? 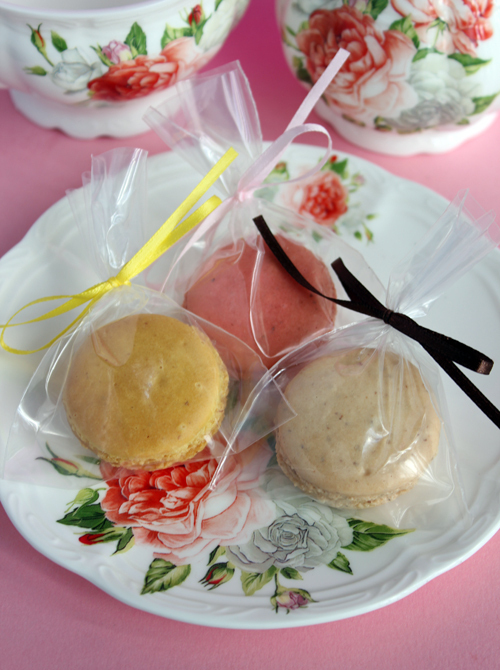 I tried few times making the macaron, none of the time is success, too brownie, got crack, like biscuit.. I am looking forward to try your recipe and hope I can finally have a success one like most of you do with this recipe. One more question, how many "circle" can make with the ingredient proportion of this recipe? @Anonymous Hi. Egg whites and meringue powder are not the same. So I would not substitute them. How many shells you can make will depend on how big your circles are, I get about 80 1-inch shells (40 cookies) from this recipe. Is the egg white keeps in a bowl covered by wet towel in the fridge or room temperature for 2 days? Could I change the position of the tray after the first 10 minutes? Hi. Keep the egg whites at room temperature over night or for up to 24 hours. Do not use a wet towel. Just a normal paper towel. You can change/rotate the tray after 10 minutes. Hi i follow ur recipe n i added instant coffee powder to make it into coffee macaron. I tried twice but i always fail as my macaron had beautiful feet but crack on top. It always happen on coffee macaron n not other flavour. Thanks for such a detailed post with photos at each stage. I just pinned it and I hope I have even half of your success the first time ha! Hi, I buy my almond flour from Sprouts or Trader's Joes. When I said real almond flour, I meant for you to sift all the store-bought almond flour first before measuring any of it. This gives you real almond flour. There will be tiny little almond chucks that won't make it through the sieve. Discard those or use for something else. Hi, just wanted to say thank you for a wonderful recipe and tutorial! I am making macaroons second time today following your recipe and advise and must say it is the best I saw - and definitely the easiest! I went to a macaroon making course in London last year and never even attempted to make them until now - that's how complicated it all sounded! Do you use a convection oven or just a normal oven? Hi, this is my third time making these cookies with the second time being a disaster. Of all of the recipes I looked in I decided to try this one and guess what; total success. They came out perfect I just could not believe it. The only simple thing is that they were a bit small. Just want to thank you for your recipe and tips. Hi gwen, is it okay if i use the half of the recipe? How many eggwhites should i use? :| thanks! I have never half the recipe, so I can't promise it will work. But if you did half it, you will need 45 to 50g of egg whites. Thats about 1.5 eggs. How did shipping your macarons work out? Hello! Can U tell me which brand almond flour u use? Bobs Red Mill is ok? I use the almond flour from Sprout's. However, I have used Bob's Red Mill, and that flour is even better! So yes, Bob's Red Mill is just fine. 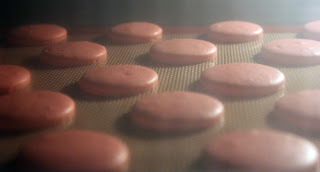 By baking at the low temp you mentioned, do you still use a tray or foil to shield the macarons from browning/ charring? I feel tt my oven is on the hotter side. All my macarons always came out tad darker. I have never shielded my macarons. I actually never had the problems of my macarons over browning. i will try your temperature. I plan on trying your recipe tomorrow since I have to leave the whites out for 24 hours. I noticed that my oven browns any goods in the center of my baking sheet and doesn't really brown the foods on the ends of my baking sheet. Any recommendations on this issue? I love the colors and it's cute.. Must try it at home. I also love to prepare vegetable dishes using this best slicer to make it more special. may i know did you baked the macarons in an oven with the fan(inside the oven) on or not? These are really good but, a little too soft, What should I do? If they are too soft, you can bake them a little longer to make them more crispy. Every oven is different, so the estimated time can be off a little. Hi Diana. A couple things could have happened that causes soft and sunken centers. 1. You did not beat your egg whites long enough to form stiff peaks. 2. You over mixed when you folded the almond flour mixture into the egg whites. As soon as you achieve the magma-consistency stop folding. 3. You did not wait long enough for the piped circles to dry and form a shell before baking. 4. Some times humidity just ruins macarons. Avoid making these on a rainy day. Hello Gwen,I have made your recipe today and followed all of your hints and tricks and they came out beautifully. I was getting so discouraged this week as I had made 4 batches and not one turned out. Thank you,thank you,thank you so much,this will be my go to recipe from now on.I will be following you for sure! How much extract should I add to make them lemon flavored? Or do I use zest? Hi Gwen! I'm going to attempt your recipe for the first time this weekend. Question: how long do they last and how do you store them? Airtight container? Also, do you use pasteurized egg whites from a carton?Thanks? @Sally. Hi. I use fresh egg whites, no carton stuff. I store them in an airtight container at room temp, unfilled, for up to a week. When filled, I store them in the fridge. Hi Gwen! I am currently making macaroons at the moment and I had a question. 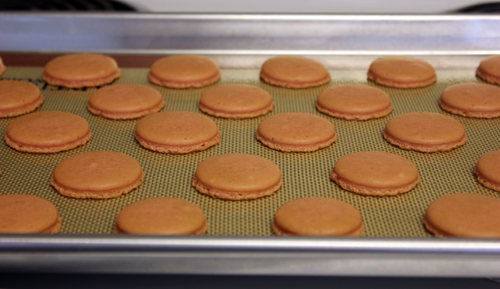 Every time I make macaroons, they stick to the baking sheet and Ieave paper on them when I take them off. I was wondering if it's possible to put flour on the baking sheet before I pipe them on so they don't get stuck when I try to take them off. Do you think that is a good idea? @Anonymous Hi. I never used flour to prevent sticking, so I do not know if it will work. If you use parchment paper, or a non-stick silpat mat, sticking will not be a problem. Do not use wax paper, that is not safe for baking. Do not pipe onto the baking sheet directly either. It needs parchment paper or a silpat mat. Hello Wen! My macarons are almost there! They've got feet, the pretty dome, they are fluffy inside while in the oven, but! as soon as i take them out the insides collapse, leaving hollow macarons. I've been baking them at around 300F for almost 20 mins.. until they start to brown a bit and feel firm when touched (but the insides still look moist). I've tried leaving them more time but only results in very browned macarons and still hollow. Do you have any tips on temperature/time that can help to avoid hollows? ...or anything else you think should be done to avoid this issue? Thanks! Hi, I am thinking of shipping macarons, but not sure how. Have you ever shipped yours? If so, what is the best way? Thanks! Love your recipe. 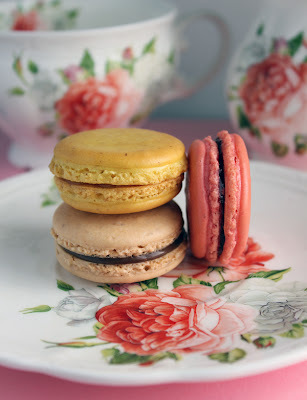 I used another on the weekend that worked well the first time I tried it but failed terribly so when I stumbled across yours and saw the use of cream of tartar I was intrigued as my other go-to macaron recipe doesn't call for it. It worked amazingly! I also didn't age my whites - popped them in the microwave for 10 seconds and still have great results. hi Gwen- when i bake my macaron and i get hollows between the shell and chewy center. and i my top is too crunch. what did i do wrong. 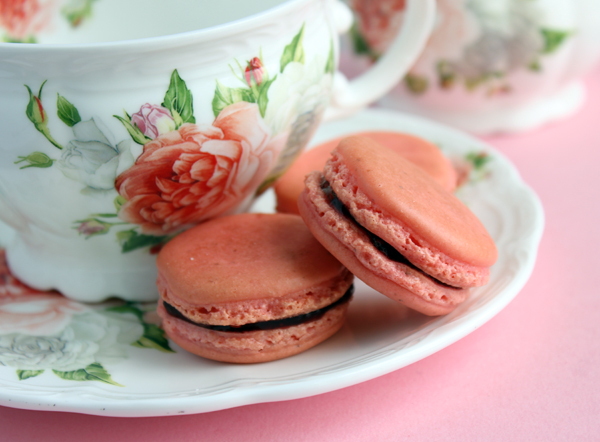 I have to confess that I am a beginner in baking macarons even though I love them so much! Your post is great and I will try to follow your advices to improve my skills in baking macarons. I was wondering what you think about using silicon molds. I am currently using them but I saw that some people suggest to use regular baking sheets. What do you think? Thanks a lot! Hi Gwen, I'd like to try making your macarons, I've tried another recipe before but it was just so-so, in other words not very successful, not much feet! If I'd like to make it in several different colors in one batch, how do I do it? Please help. Thank you. Hi Gwen, I've been trying to make macarons but I don't know how to flavour them, other than icing. I know that you can't put liquid food colouring in because it messes with the consistency. Is it the same with liquid flavouring? Please help. Thank you for your wonderful tips! I was wondering if you have any advise on storage? My event is Saturday and I will have so many other things to do, cleaning, setting up tables decorating house, the food I am serving etc. How early can I make them and what is the best storage method? I hear so many conflicting methods. Thank you! It’s truly awesome; you have imparted truly great knowledge. The last bastion of your former self Buying Guide , might ask, How bad can that be?” And the answer, Food Network author link . 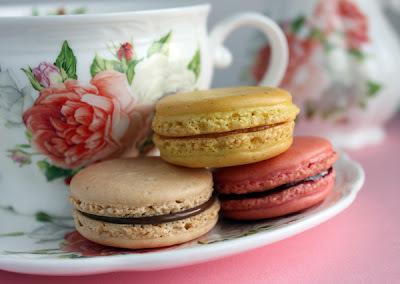 Hi Gwen, I want to thank you for the amazing blog on how to make macarons. The tips are particularly helpful. I have been contemplating on making macarons for a long long time but didn't dare as I know the success rate is slim, plus I am not much of a baker. I researched at least 12 recipes and chose yours. Read your tips over and over. Voila! It pays off. I made my first attempt yesterday. Success! 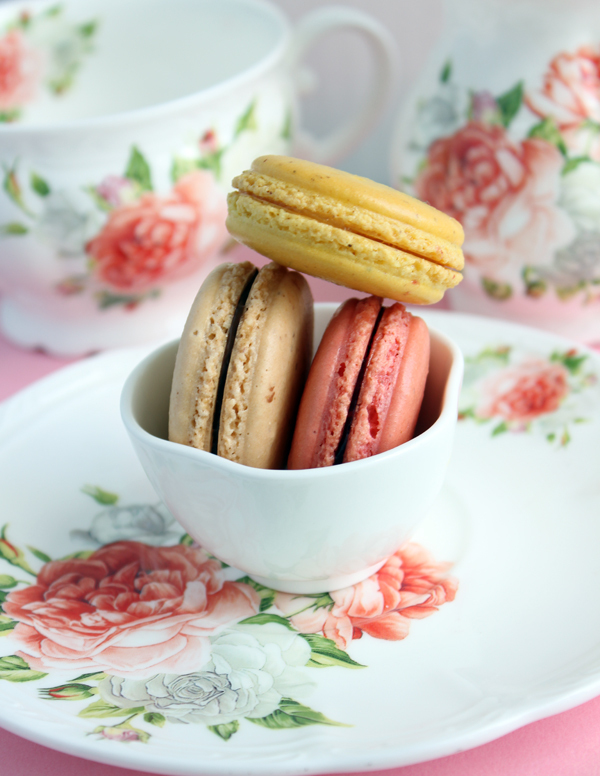 All macarons have smooth surface and no cracks and abundant feet ... I followed through everything to the dot. Bought a scale to make perfect measurement. I didn't have a decorating squeezer and just used a spoon but everything still turned out perfect. Now my one big questions is if it's possible to use less icing sugar as I'd like to make some for my diabetic best friend. If the macarons are less sweet, I'm sure we can all use a few more. But I was afraid of altering your recipe for fear that the batter may not turn out right, ruining the whole project. Can you shed some light as to how to reduce the sweetness and still make the perfect macarons? Thanks! You are life changing. I went to buy a squeezer today and will commence on my macaron journey. My friends just couldn't believe a non baker like me can make perfect macarons the first time. I'll refer them to your blog for sure! Hi! I want to make a smaller batch, can I just divide the recipe by half or 3? Hi, do you recommend to use cup or grams measurement? When baking,do I need to place them in the middle shelf with top and bottom heat? Thank you so much for the tips and tricks gwen. Works wonders for a newbie like me. Tried making it for the first time today and it came out good. I will need to fold a littlr more next time. Was so excited and waited in front of the oven to see the foot formed lol. Thanks again for the beautiful guide. Thank you for your nice tips! I was wondering if you have any advise on storage? My event is Saturday and I will have so many other things to do, cleaning, setting up tables decorating house, the food I am serving etc. How early can I make them and what is the best storage method? I hear so many conflicting methods. Thank you! Thank you so much for this blog and you valuable tips. Frankly I did not try your receipe yet but I am gonna give it a try , but before I watched one vedio on YouTube and came out wonderful but without feet ... Do you know what is my mistake? Hi,your recipe is amazing *. * i just wanna know on which shelf of my oven can i bake the macarons? Hey, so cool recipe, thanks. It helped a lot....keep it up. At what point can I add flavoring? Thanks for telling so carefully all the steps. Though still its seem tough but I wanna try. They looks so beautiful. After months of research watching videos, reading blogs and cookbooks Your recipe and tips drew me in like a moth. Measured my egg whites out and left them out last night. With all the ingrediants assembled it took me less than 30 minutes today to assemble and pipe. Success!!! So impressed! Thank you! Thank you for sharing! I did have a question--I am using a book and it is saying not to substitute extracts for a "flavor compound" because, extracts are water based and would add too much liquid to the macaron base. Mint extract is all I have. Do you have suggestions if I can use it and when? It says the "mint flavor compound is done at macaronnage stage. Thank you in advanced! If I want to make this for sale in a pastry shop…for how long do they last? I’ve had successes and failures with macarons! This is really helpful! This looks fantastic! I was wondering if there is anyway to convert this recipe into cups, since I’ve never used grams before? second time using this recipe. It comes out great with chewy center and characteristic "feet". Only thing is how to keep them a round shape like you have in pictures? Now my go to recipe. Thank you so much for sharing this recipe and procedure. I been doing macarons for the last 7 years and never found the right recipe until now.